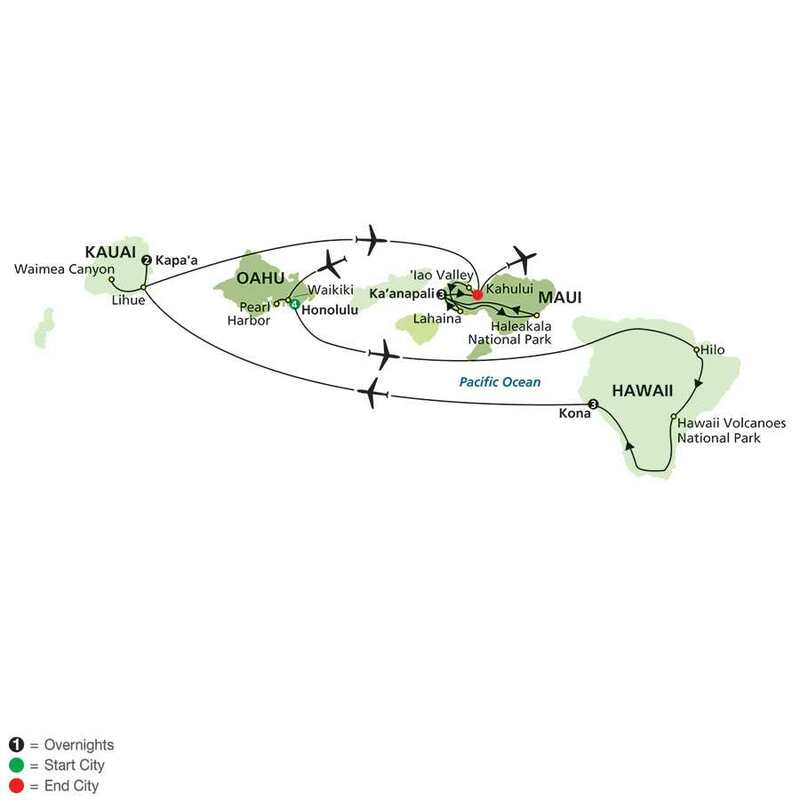 Hawaiian Islands – 4 Islands! 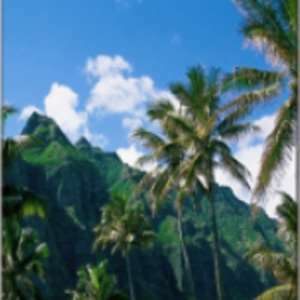 Discover the tropical beauty of Hawaii during this magnificent vacation, and enjoy pure tropical bliss as you island hop from Oahu to Hawaii and Kauai to Maui. Whether you’re admiring the natural beauty of Kauai’s Waimea Canyon, or just relaxing on the warm sands of Waikiki Beach, you’re sure to be delighted. Visit Pearl Harbor’s famous Battleship Row in Honolulu. 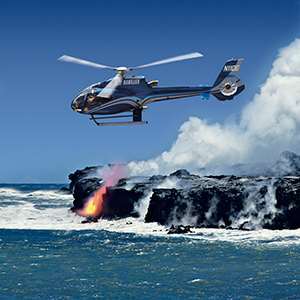 Marvel at the black-sand beaches on Hawaii’s Big Island and discover famous Hawaii Volcanoes National Park. Be mesmerized by the pineapple and sugar cane fields, and thoroughly savor Kona coffee, some of the best coffee in the world! 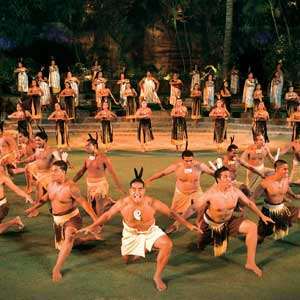 Enjoy a festive luau with Polynesian dancing in Kauai. Revitalize your spirit in Haleakala National Park, with its volcanic landscapes and sub-tropical rainforest, and enjoy the laid-back atmosphere as you feel your senses come alive—all at an affordable price! Morning orientation with your Tour Director before enjoying your day at leisure. 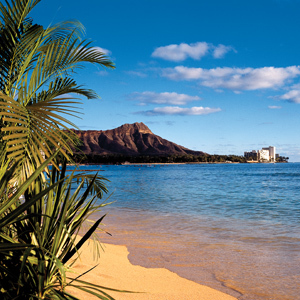 Your Tour Director will have suggestions, including activities near world-famous Waikiki Beach or a full-day optional outing to the Polynesian Cultural Center on the island’s North Shore, where you’ll enjoy a dinner buffet and the colorful H: Breath of Life stage show. This morning, your sightseeing excursion features the sunke USS ARIZONA and its impressive memorial to the men still entombed there, as well as Punchbowl National Cemetery with its beautiful views of Honolulu. Other sites include bustling Chinatown, ‘Iolani Palace, and the statue of King Kamehameha the Great. The afternoon is free for independent activities. Tonight, join the optional sunset dinner cruise along the shores of Waikiki. Shown in UPPERCASE in the tour description, including admission charges where applicable. Oahu Grand Circle Island Tour The most popular tour of Oahu takes you on a 120 mile trip around the beautiful island, including a visit to Kualoa Ranch & Dole Plantation. 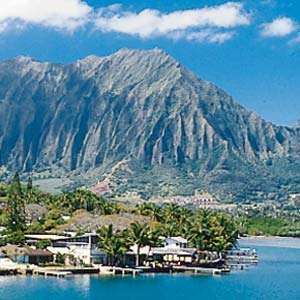 See Oahu from Hanauma Bay to the North Shore with stops at Kualoa Ranch, Dole Plantation, Pali Lookout, Boydo-In Temple and more. Tour is approximately 9 hours. Polynesian Cultural Center Buffet and Show A full-day tour departing at noon from Waikiki to the windward side of the island and the town of Laie. The Cultural Center has seven villages representing the nations of Polynesia. Price includes admission, IMAX film, buffet dinner, and show. The Island Buffet’s array of dining delights is sure to please any palate. Of course, true to Polynesian tradition in which feasting has been elevated to an art form you’re welcome to fill your plate as many times as you’d like. Return to Waikiki at approximately 10:30 p.m.
Polynesian Cultural Center with Ali’i Luau A full-day tour departing at noon from Waikiki to the windward side of the island and the town of Laie. The Cultural Center has seven villages representing the nations of Polynesia. 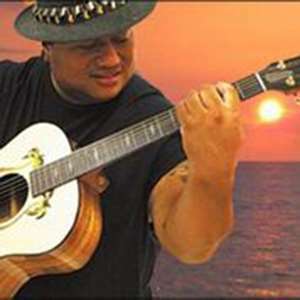 Price includes admission, IMAX film, Ali’i buffet luau dinner, and luau level show seating. The Ali’i Luau recreates the royal ceremony of ancient luaus’ including the traditional custom of roasting a pig in an “imu” the Hawai’ian word for fire pit. Receive a complimentary orchid lei upon arrival, enjoy native song and dance, and then dine on a delectable island menu. And remember, it’s all you can eat. Return to Waikiki at approximately 10:30 p.m.
Star Sunset Dinner Cruise & Show Enjoy casual elegance with crab and sirloin steak dinner plus “My Hawaii – Lei of Memories”! After a welcome Mai Tai, explore four panoramic decks for breathtaking views of the Hawaiian sunset and coastline, and complete your evening with our magical “My Hawaii” show. “My Hawaii – Lei of Memories” is a celebration of Hawaii’s beauty and culture, this original show is a “must see” on Oahu! There will be fun and dancing until disembarkation. (Approximately 2 hours) Transportation to and from your hotel is included. Three Star Sunset Dinner Cruise & Show A fun and exciting evening with a whole Maine lobster and tenderloin steak dinner plus show! Your voyage begins with a “champagne” toast, followed by continuous entertainment from welcome hula, to live Jazz, magical “My Hawaii – Lei of Memories” show is a celebration of Hawaii’s beauty and culture, this original show is a “must see” on Oahu! 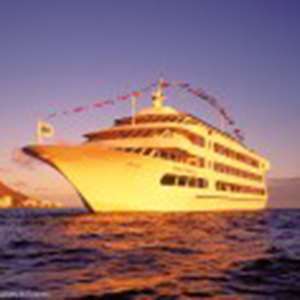 Enjoy unparalleled vistas of Waikiki and beyond Diamond Head from the four decks including the 60′ high observation deck. There will be fun and dancing until disembarkation. (Approximately 2 hours) Transportation to and from your hotel is included. Glassbottom Boat Cruise Cruise around Kailua Bay on this glass-bottom boat for fantastic views of the colorful coral formations and unique marine life. The boat was designed to allow access to very shallow water, sometimes just a few feet deep, where you will view more colors then in deeper water. 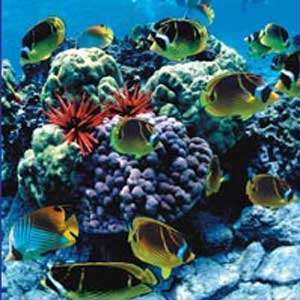 You will see close up and personal a myriad of beautiful tropical fish, a wide variety of living corals, and many other sea creatures that inhabit the reef. It is not unusual to see a friendly pod of local spinner dolphins. 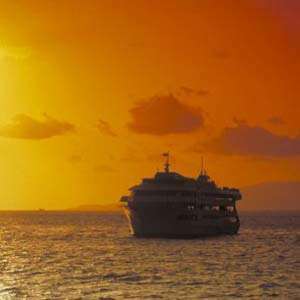 Historical Sunset Cruise – Body Glove Cruises Step aboard and journey back in time, when ancient, powerful Kings ruled the rugged and fertile land of the Hawaiian Islands. This three hour guided historical cruise to Kealakekua Bay and Captain Cook’s monument will capture your imagination and reveal many secrets of the Big Island. Upon arriving in Kealakekua Bay a Hawaiian style buffet dinner is served while listening to live entertainment and watching the sunset on the way back. Includes one complimentary cocktail and cash bar thereafter. (Must be 21 to consume alcohol). Kohala Waterfalls Adventure The tour begins with a wonderful drive of contrast and change from the dry-side resort area to the lush green country of Kohala. 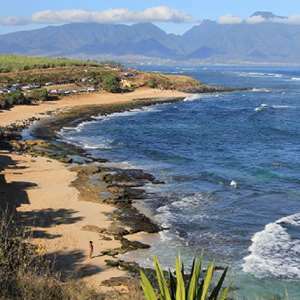 Along the way you’ll journey up the North Kona and Kohala coastlines over lava flows from Mauna Loa, Mauna Kea and the Kohala Mountains. At the end of the road we pass through a locked gate onto private property, and the real fun begins, with a bumpy but short off-road drive in our 6WD Pinzgauer on an old cane road. Out of the Pinzgauer, you’ll step back into the early 1900’s, when plantation owners began construction of the Kohala Ditch Trail to bring much needed water to the sugar cane fields. Along the 1.5 mile hiking trail you’ll see tunnels blasted and carved from solid rock, walk over an aqueduct on two bridges, and learn the story of the tremendous effort it took to build an irrigation system stretching over 22 miles. 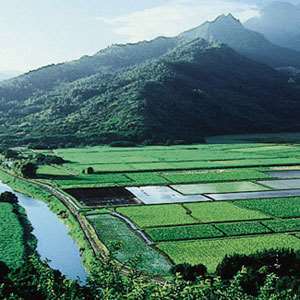 You’ll delve into ancient Hawaiian history as well, visiting a former taro farming site just off the path. Seven beautiful waterfalls grace the trail. You can take a refreshing dip in the last pool we visit, and play under a refreshing cascade. 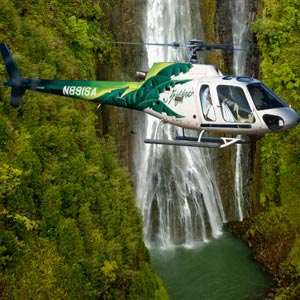 With stunning mountain panoramas, green valleys and pasturelands, and of course the abundant water, the Kohala Waterfalls Adventure is a fascinating way for young and old to experience Kohala’s “story of water” however is intended for an experienced hiker. Kohala Zip & Dip Adventure Double the adventure with the new Kohala Zip & Dip! 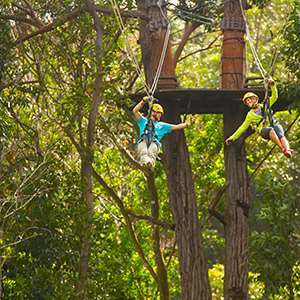 Soak up Hawaiian culture as you zip through the trees and across 9-lines, 5 suspension bridges, a rappel and 14 tree based platforms in the Halawa Lands of Kamehameha. Enjoy lunch at our breathtaking private picnic area on the rim overlooking Pololu Valley. Explore our private mountain stream where a waterfall swim awaits. This is the adventure you’ll take home and talk about for years to come. Mauna Kea Summit & Stars Adventure with Hawaii Forest & Trail The drive to the summit of Mauna Kea is one you’ll never forget. It’s hard to believe you’re in Hawaii as you climb to an elevation of 13,796 feet above sea level. After a hot, picnic-style dinner, we make our way to the summit of Hawaii’s most sacred mountain. 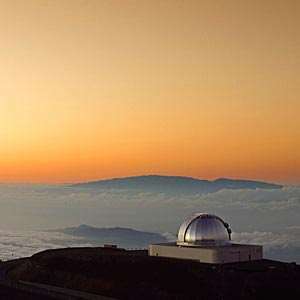 Once at the summit, we are afforded spectacular views of the horizon, Haleakala on Maui, Mauna Loa and Hualalai, and Mauna Kea’s world-class array of telescopes. Mauna Kea is the world’s tallest mountain, rising over 32,000 feet from the ocean floor to its summit, which is considered by many Hawaiians to be the most sacred place in all the islands. In your hooded parka, you’ll stand in awe at both nature’s sublime creation and man’s astonishing technological achievements. Please check your itinerary and flight times before booking this excursion. Snorkeling & Dolphin Cruise – Body Glove Cruises Accessible only by boat, the remote Pawai Bay offers visibility up to 100 feet and enchanting coral gardens that are home to at least 600 species of brightly colored tropical fish-a virtual snorkelers’ paradise. Watch sea creatures beyond your imagination as they dart and drift around the interesting rock and coral of this protected marine environment. Spinner dolphins frequently join while the boat is underway-jumping, spinning, and riding the wake as you cruise to the snorkeling destination. 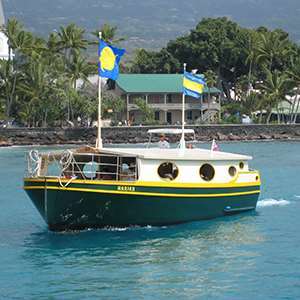 Cruises depart daily from Kailua Kona Pier. Includes a continental breakfast of fresh juice, coffee, tea, and pastries along with a delicious BBQ burger lunch, refreshments, Rx masks, snorkel gear, snorkeling instruction, 2.5 hours water time, flotation and water toys, 20-foot water slide, fresh water shower, no host premium bar, his and hers restrooms. Sunset Manta Ray Snorkel Your adventure is at night for the best viewing of the mantas. Although you can view mantas during daylight hours, they feed most actively at night, when many plankton rise towards the surface, providing one of the favorite foods on which mantas feed. 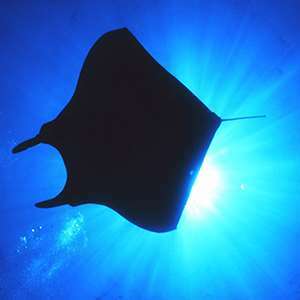 Using dive lights that are safe for the manta, we are able to attract these plankton which attracts the mantas. Manta rays do not have stingers like the Sting Rays, mantas are completely safe to be around. This cruise includes warm soup & bread rools, snack mix, hot drinks (tea, coffee & hot chocolate), snorkel gear, wetsuit and instructions. Wine and beer available for purchase. Ali’i Movie Tour With Scenic Hanalei The Hawaii Movie Tours on Kauai is a unique opportunity to experience the island through Hollywood’s eyes on an expert guided tour of Kauai’s famous movie locations. 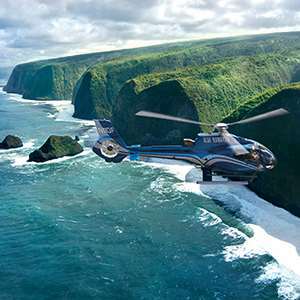 The fun-filled 6-hour narrated tour is aboard an air-conditioned minibus that will stop at Kauai’s iconic movie locations while also viewing film clips of some of Hollywood’s most notable movies filmed on the island. A perfect spot has been chosen to go along with our movie theme. Lunch is included at the famous and rustic Tahiti Nui where George Clooney’s newest movie was filmed, The Descendants. Fern Grotto During the two mile river journey, you’ll hear songs and stories of ancient Hawaii; like the King’s Highway, sacred Mount Kapu, and the First Hau Tree. In addition, guests enjoy learning the hula during a lesson provided by a young hula dancer. Everyone gets into the act during the river cruise! 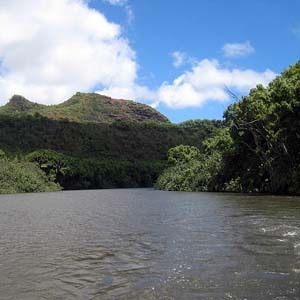 The Wailua River is known as the only navigable river in all Hawaii. The river’s fresh water pours down from Mt. Wai`ale`ale, one of the wettest spots on the planet. 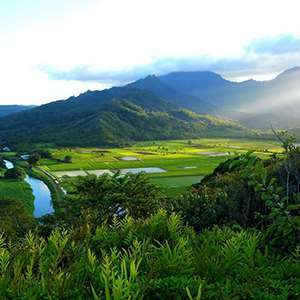 Lands along the river were the sacred capital of ancient Kauai and the birthplace of the island’s ali`i, or royalty. 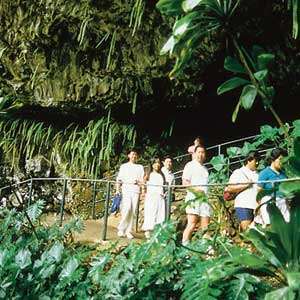 At the Fern Grotto landing, you’ll enjoy a short nature walk through the rainforest to the lush Fern Grotto. The Fern Grotto is a geological wonder of Kauai. Ferns grow upside down from the roof of the grotto, which was formed millions of years ago. 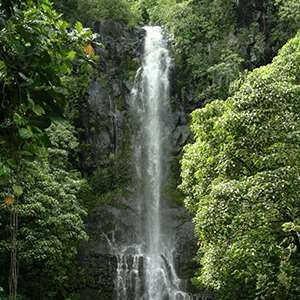 Native Hawaiian plants and colorful exotic tropical plants provide a rain-forest atmosphere. Kauai Zip Line Adventure After a brief ride into the mountains, guests are outfitted in custom Zipline gear and head toward the first of eight thrilling ziplines. Set against a backdrop of breathtaking mountains and with sweeping ocean views, the ziplines soar over three different valleys, getting longer, higher, and faster throughout the adventure. 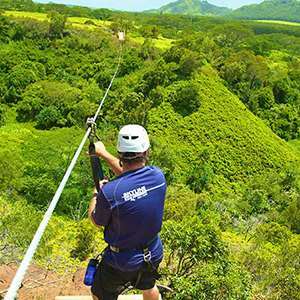 Certified zipline guides will share legends of Menehune and other fascinating Kauai stories throughout this 2.5 hour zipline tour. 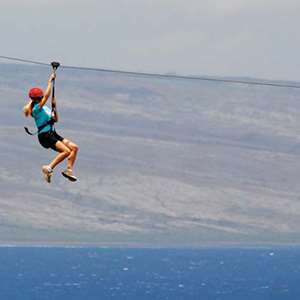 Ka’anapali Zip Line Adventure (8-line) A short off-road adventure in one of our 4WD all-terrain vehicles delivers you to the trailhead, where you’ll discover eight world-class ziplines and enjoy a gourmet Hawaiian snack on our viewing deck, overlooking a stunning 1,000 ft. valley. Maui Sunset Dinner Sail Combine the best of both worlds, taking pleasure in a fun and comfortable sail aboard a luxury catamaran, while dining on an incredible meal catered by an award winning chef. Relax and enjoy a delicious beverage as you embrace another breathtaking Maui sunset. Original Maui Sunset Sail What better way to end your day, or start your night, than on board Teralani’s Original Sunset Sail. Sip on a refreshing beverage while soaking in the incredible coastal views of Maui. 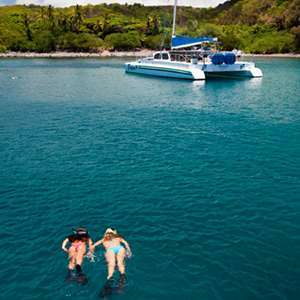 Premier Snorkel – Teralani For those that love adventure and a great BBQ, this is definitely the trip for you and your family. The day starts with delicious Kona coffee, tropical juices and a continental breakfast. You will experience two premier snorkel destinations (seasonal) as the helpful crew takes care of all your needs. After dropping the anchor to snorkel, they fire up the grill and prepare a delicious BBQ meal for you right on the boat! Everything is included just bring a towel and sunscreen. 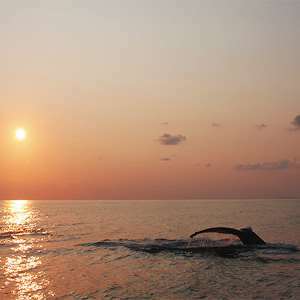 Teralani AM Maui Whale Watch Each year the Pacific Humpback Whales migrate from Alaska to the coastal waters off Maui. Being on board one of our spacious catamarans is the best way to experience these gentle giants and the surrounding beautiful West Maui scenery. Make this an exciting learning experience with a marine naturalist on board each trip. You will actually be able to listen to the whale songs live on our under water hydrophone. The whales are not the only return visitors you may see while on the Morning Whale Watch. There are many of our guests that return year after year, always being sure to include Teralani on their ‘must do’ list! Teralani Mid-day Maui Whale Watch Each year the Pacific Humpback Whales migrate from Alaska to the coastal waters off Maui. Being on board one of our spacious catamarans is the best way to experience these gentle giants and the surrounding beautiful West Maui scenery. Make this an exciting learning experience with a marine naturalist on board each trip. You will actually be able to listen to the whale songs live on our under water hydrophone. The whales are not the only return visitors you may see while on the Morning Whale Watch. There are many of our guests that return year after year, always being sure to include Teralani on their ‘must do’ list! West Maui Snorkel Our experienced captains know where to find the best snorkel spots on West Maui, and our informative and helpful crew will get you ready for an incredible underwater adventure. All of our high quality snorkel equipment, floatation devices and lessons are included. After snorkeling, feast on a build-your-own deli style lunch, complete with an open bar. Then just sit back and relax as we sail back (seasonal) to Ka’anapali. 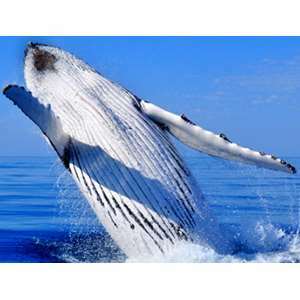 Whale Watching Experience the thrill of whale watching in Maui on a 2-hour whale watch cruise. This educational and informative adventure is great fun for the entire family and offers spectacular sightseeing and photo opportunities. Public transportation is available for $2.00 each way. Guaranteed Shares for standard view only.